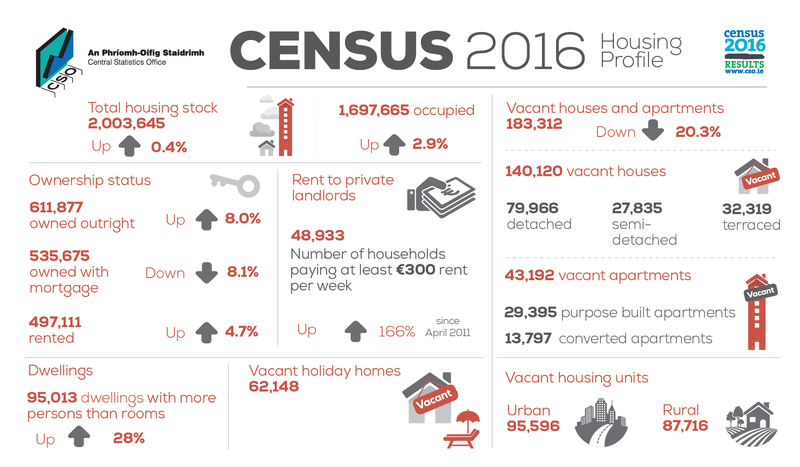 Census 2016: Housing In Ireland – What has been happening in the Western Region? Last week the CSO published their first full volume of statistics from Census 2016 – Housing in Ireland. The infographic below illustrates some of the data available. Below, we take a look at what some of the headline figures say about housing in the Western Region. What is the housing stock in the Western Region? Overall the housing stock in the Western Region in 2016 amounted to 404,494 units, accounting for 19.9% of the national total. There was a marginal increase since 2011 of 0.1% or 333 units, less than the national increase of 0.4%. These relatively small increases are not surprising following the economic crash and the very limited house building that has taken place since then. A blog post last September reviewing the preliminary results made some observations on the 2006 to 2011 period also, see here. Within the Western Region there was an actual decline in housing stock in three of the counties, (see Table 1 below), Roscommon, -0.9% (-300), Sligo -0.8% (-280) and Leitrim -0.4% (-77), indicating some houses have been removed from the housing stock. The data does not tell us specifically the reasons why, but could include ‘ghost estates’ which have become demolished, derelict or abandoned. A change of use, from residential to commercial, could also be an explanation. Though these are marginal changes, Galway county and city recorded percentage increases in housing stock higher than the State average of 0.4%. What are the vacancy rates in the region? The vacancy rate measures the share of the housing stock in each county that is recorded as a vacant dwelling by the Census enumerators. Nationally, the vacancy rate in 2016 was 12.3%, a decrease of 2.2 percentage points on the 2011 rate of 14.5%. Table 2 below shows the vacancy rates for counties in the Western Region. All counties in the Western Region experienced a slight decrease in their vacancy rates between 2011 and 2016. Leitrim (29%), Donegal (27.4%), Mayo (23.4%), Roscommon (20.9%) and Sligo (20.1%) had the highest vacancy rates in the region, all exceeding 20% or one fifth of supply. Conversely only counties Galway and Clare had rates less than one fifth. Galway city (10.5%) had the lowest rate in the Western Region. Source: CSO, Census of Population 2016. Figure 4.3 below illustrates the combined number of vacant houses and apartments per 1,000 inhabitants at county level in 2011 and 2016. Nationally there were 38 vacant homes per 1,000 people in April 2016, a fall from the corresponding figure of 50 recorded in 2011. The highest number of empty dwellings (excluding holiday homes) relative to population size was in in Leitrim where for every 1,000 people in that county there were 112 vacant homes. This is followed by Roscommon, Mayo, Donegal and Sligo. In fact all Western Region counties fall within the 10 counties with the highest number of empty dwellings relative to population size. Only Galway city is comparable to the State average. The lowest number of empty dwellings (excluding holiday homes) relative to population size was in South Dublin (13) followed by Fingal (17) and Kildare (20). Of the total 183,312 vacant houses and apartments, 64% (117,381) were located within the 873 settlements (cities, towns and villages) identified in Census 2016. At individual town level and excluding holiday homes, Keshcarrigan (45.6%) in Leitrim had the second highest vacancy rate after Blacklion (46.4%) in Cavan. Among the urban towns (i.e. towns with a population of 1,500 or more) the highest vacancy rates were recorded in Ballaghaderreen (33.1%) and Castlerea (27.7%) in County Roscommon, along with Bundoran (29.9%) in County Donegal. Among the larger towns with a population in excess of 10,000 the highest vacancy rates were in Letterkenny (14.9 %), Longford (14.6 %) and Ballina, Co. Mayo (14.3 %). It is interesting to observe the change in status of the housing stock that existed in 2011 especially considering there has been so little change in the overall housing stock. In Census 2011, there were 230,056 vacant houses and apartments. Of these the change in status in stock can be measured in 81.9% of cases. Figure 4.6 below shows the dwelling status of Census 2011 vacant dwellings in 2016 capturing those that remain vacant, those that are occupied and those that other/unknown. Overall, Census 2016 results show that 34.5% of dwellings (65,039) were recorded as vacant in both censuses, while 105,384 (55.9%) which were vacant in 2011 were occupied in 2016. The Western Region counties have the lowest rates of occupancy and highest rates of vacancy. All Western Region counties are among the top 8 counties with the highest vacancy rates. The counties of Mayo and Roscommon had over 40% of vacant dwellings with the same status in 2011 and 2016. The greatest reduction in 2011 vacant dwellings occurred in city and suburban areas where over 60% of dwellings changed from vacant to occupied across the counties of Fingal, Dún Laoghaire-Rathdown, South Dublin and Cork City. Within the Western Region, 30.3% of dwellings in Leitrim which were vacant in 2011 were occupied in 2016, while the rate for County Galway in 2016 is 38.3%. In Galway city 56.8% of previously vacant dwellings were occupied in 2016. While the total housing stock grew by just 8,800 (0.4%) between 2011 and 2016, and by just 0.1% in the Western Region, there is more change evident in occupancy and vacancy rates. It is also very clear that there are huge differences in housing stock and vacancy rates across the country. While the counties in the Western Region have the highest vacancy rates there is evidence of change here too, with for example Leitrim showing an increase in occupancy of 30% of those dwellings that were vacant in 2016. This analysis also highlights the value of a five yearly census. The changes evident in the last 5 years are striking compared to that which occurred 5 years earlier. As such these data are vital to informing policy and research. Changes in the fieldwork which were adopted for both the 2011 and 2016 censuses, mean that a direct comparison at individual dwelling level is possible for 188,390 (81.9%) of these units. The remaining vacant dwellings in 2011 have either fallen outside the housing stock in 2016 (i.e. categorised by Census 2016 enumerators as Derelict, Commercial Only, Under Construction or as not existing) or a direct comparison was not possible. https://www.wdc.ie/wp-content/uploads/infographic-feat-image.jpg 170 1051 WDC https://www.wdc.ie/wp-content/uploads/wdc-567.png WDC2017-04-24 11:02:132017-04-25 12:09:03Census 2016: Housing In Ireland – What has been happening in the Western Region?